Volvo Buses has been awarded a public tender with Fanalca/Transdev and Somos K to supply 700 city buses to Bogotá in Colombia. The buses will operate on Transmilenio, Bogotá’s BRT (Bus Rapid Transit) system. The new orders are the largest in 10 years for Volvo Buses in Latin America and confirms its leading position in the BRT segment. The buses are Volvo B340Ms, 298 of which will be articulated and 402 bi-articulated. They will be powered by 12-litre engines and will have a passenger capacity of 160 and 250 respectively. The chassis will be bodied by Superpolo in Colombia and deliveries will start in March 2019. Bogotá is replacing its Euro II and Euro III buses with new vehicles that meet Euro V emission standards. Along with the changeover, the Colombian capital city is also expanding the capacity of its BRT system by about 30% through the introduction of more bi-articulated buses. “We are very proud and delighted to once again have the privilege of delivering a large number of city buses to Bogotá, thus contributing to an improvement in the city’s air quality,” said Håkan Agnevall, President Volvo Buses. Articulated and bi-articulated buses operating in BRT systems such as Transmilenio is a well-proven solution for improving the efficiency and sustainability of public transport in metropolitan areas, says Volvo. They speed up passenger movement, reduce emissions per passenger transported and cut operating costs. 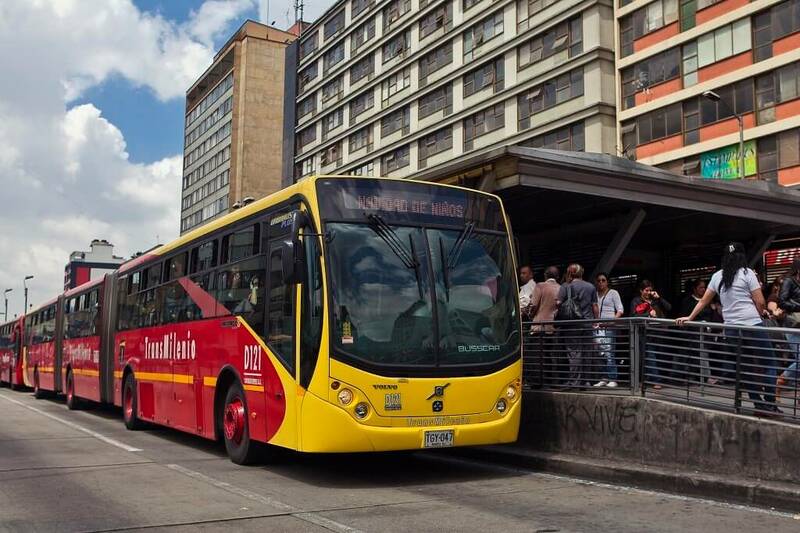 Since 2001, Volvo has delivered more than 2,300 city buses to the BRT system of Bogotá. The fleet includes almost 360 of the company’s hybrid buses, making this the largest fleet of electromobility buses in South America. Volvo is a pioneer in the development of buses for BRT systems and is a market leader in Latin America. With this most recent order, the company has delivered more than 5,000 buses to BRT systems in Curitiba (Brazil), Bogotá (Colombia), Guatemala City (Guatemala), Mexico City (Mexico), Santiago de Chile (Chile) and San Salvador (El Salvador).